At last, the announcement that European gamers have been waiting for. We have pleasure today in announcing that Razer is launching its updated Razer Blade Stealth and Razer Blade gaming laptops in Europe with fully localised keyboards for the UK, German and French markets. All pricing is on parity with US equivalents with the exception of course that the US prices are listed excluding sales tax while the European prices include VAT. In my interview with Min, he explains that he was always hesitant to tweet or say anything about the Blades because every time he does he always gets an earful from Europeans clamouring for a localised version with our own keyboard layouts. After a half-hearted attempt to launch the previous Razer Blade in Europe (the one with the 970M), which was only ever available with a Scandinavian keyboard for some odd reason, now we’re getting the real McCoy. The 12.5″ Razer Blade Stealth is the recently updated (with Kaby Lake i7) Ultrabook from the gaming lifestyle brand. A highly awarded and decorated machine with amazing build quality, ridiculously thin and light dimensions and a beautiful fit and finish. Ultrabook by day, ridiculously overpowered gaming rig by night. The Stealth is designed to be an amazingly high end Ultrabook for the professional to take to meetings and use for normal productivity tasks during the working day, but when they get home? Well, that’s where the Razer Core comes in. The Core is Razer’s external enclosure for full size desktop graphics cards which connects to the Razer Blade Stealth via Thunderbolt and outsources all graphical capabilities to it. So if you’re looking for something sleek to use around the office or at school but which you can come home and use to game with full +desktop class graphics on? Look no further. The Core is an optional extra which connects via Thunderbolt 3 without needing a reboot for gaming goodness. Couple all of this this with the Stealth’s ridiculously thin and light 13.1mm thin and 1.29kg weight and it’s easy to understand why the Stealth is already one of the most decorated Ultrabook’s in the world with over 20 awards. The new Razer Blade Stealth has a 7th Generation Intel Core i7 and a QHD IGZO touch display as standard. There are options on storage (it’s all PCIE SSD here) ranging from 128 – 512 GB on the QHD Stealth through to 512 GB to 1 TB PCIE SSD on the UHD (with full 100% Adobe RGB colour) version of the Stealth. All coupled with an up to 9 hours claimed battery life. Do keep in mind though that this is a dual core Kaby Lake i7 since the quad core mobile Kaby Lake chips aren’t available yet. Also launching today is the Razer Power Bank. An optional external battery that can apparently fully recharge your Razer Blade Stealth. This 12,800 mAh battery pack also has the capability to charge a phone and tablet via USB. Approx. Weight: 1.29 kg / 2.84 lbs. The Stealth can be pre-ordered in Europe starting from today and starts at £999 or €1099 while the Razer Core (shipping approximately one month later in Europe) retails for £499 or €599, although there is a discount if you order it with a Stealth and the price drops down to £399 or €449. You can get more information about it on Razer’s site here. I had time to have a quick play with each of the machines being launched today. The Stealth is an impressive piece of kit and with an external 980 Ti in the Razer Core, the Stealth managed to hit an impressive overall score of 39.62 FPS. Keep in mind though, this is strictly a productivity machine while out and about with no discrete GPU in the chassis itself, you’re limited to the onboard Intel HD 620 graphics which of course is fine for some spreadsheets and web browsing, but I don’t recommend trying to run any taxing games on it. Intel claims it can run Overwatch at 1080p, but for anything more than that, you’ll need the Blade. Aside from this, it’s as light as you expect and the fit and finish is superb. Quality is high, particularly when comparing to other brands in the Ultrabook segment where weight loss is so crucial (yes, I’m looking at you my Lenovo X1 Carbon with wonky half glued down bezel that keeps lifting up). This isn’t a cheap machine, but then Razer is something different in the market, they don’t play in the commoditised low margin space, they try to innovate and create wacky concepts, launch products that traditional investors would balk at and make a lot of good kit, but good stuff doesn’t come cheap and that’s true here too. The keyboard provides reasonable feel and of course is Chroma/Synapse enabled with a nice smooth trackpad. Most importantly, it has the £ \ “ and @ symbols in the write place! Hallelujah! I’m touching a genuine UK version! Now we come to my personal favourite. The 14” Razer Blade strikes me as the perfect balance between portability and performance. A remarkable machine that looks like a Mac Book Pro but which of course houses something crucially more interesting. A proper gaming GPU. 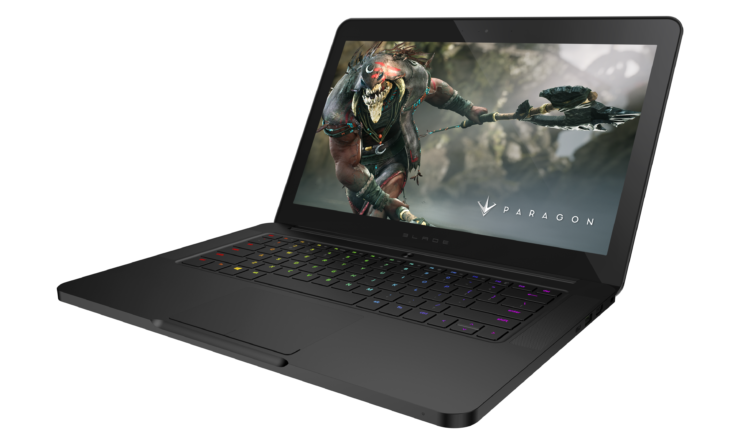 The new Razer Blade houses an Nvidia 1060. While Razer isn’t the first to launch a laptop with a 1060, it’s nonetheless impressive that they’ve managed to squeeze it into a machine as svelte as this, being just 17.9mm thin and weighing in at under 2 Kg. The Razer Blade comes with an Intel Core i7-6700HQ (Skylake), Nvidia 1060 and 16 GB of DDR4 as standard. Storage options range from 256 GB to 1 TB (all PCIE SSD’s) while on the display front you can opt for either an IPS 1080p Matte or an IGZO QHD+ 3200×1800 capacitive multi-touch panel. Approx. Weight (QHD+): 1.95 kg / 4.30 lbs. Approx. Weight (Full HD): 1.89 kg / 4.16 lbs. The Blade can be pre-ordered in Europe starting from today and starts at £1749 or €1999. You can find out more information about it on Razer’s site here. 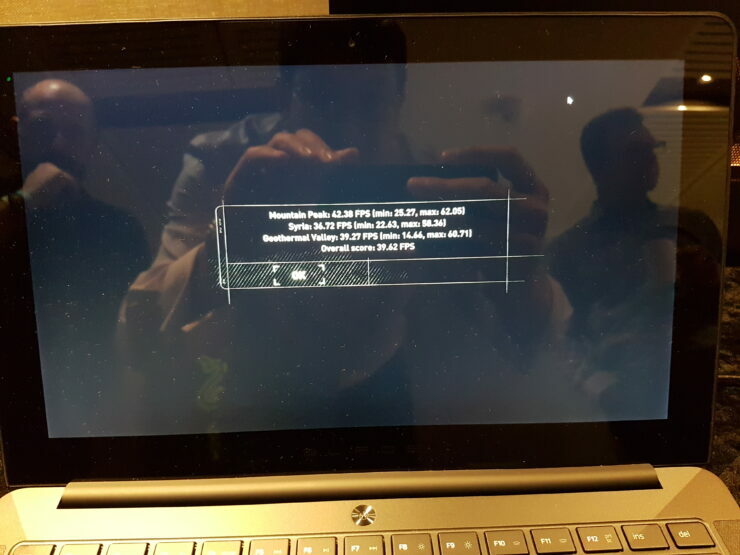 As I mentioned earlier, the updated Razer Blade is exactly what I’ve been looking for in a laptop for quite a while. Don’t get me wrong, I’d love something like this with a UHD screen and a GP102 chip but that kind of power simply isn’t going to be available in a form factor this size for quite a few more years. 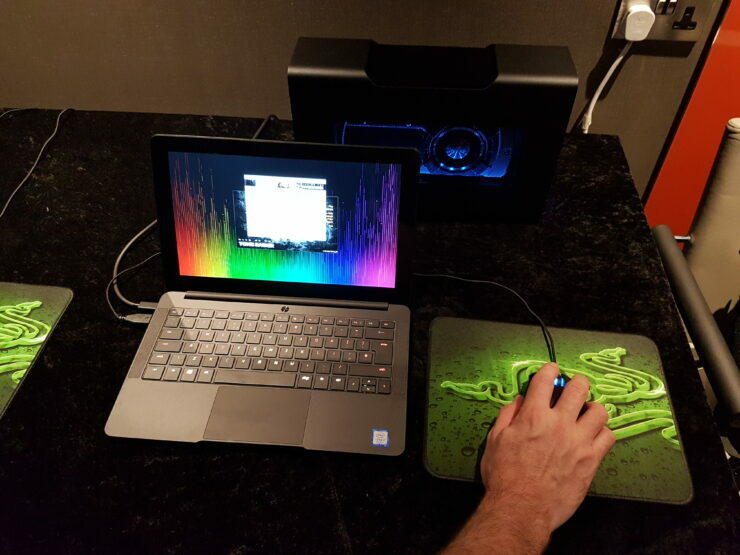 In my interview with Min (CEO and Founder of Razer, available here) for the launch, he explained that they build laptops with a user profile in mind and the Razer Blade was what he had them design for him. It’s something that’s usable for all the standard everyday productivity tasks, but which you can game on and have a good experience with while still not being weighed down by some crazy heavy gamer laptop. Many of the business people and executives of today grew up as gamers. These people often travel frequently and need something that doesn’t break the baggage allowance (or back!) and still lets them have a good experience, the perfect blend of productivity, portability and performance. The updated Razer Blade is a great feeling machine. Lifting it up it feels substantial and solid, but not heavy. It has all the hallmarks of a precision engineered piece of equipment. And I still can’t believe they got a 1060 into something this size. The trackpad is a lovely size, feels great and the sound coming out of the speakers is reasonably good. Now the crucial test. Let’s see how good this bad boy is at gaming and also, how loud it is. 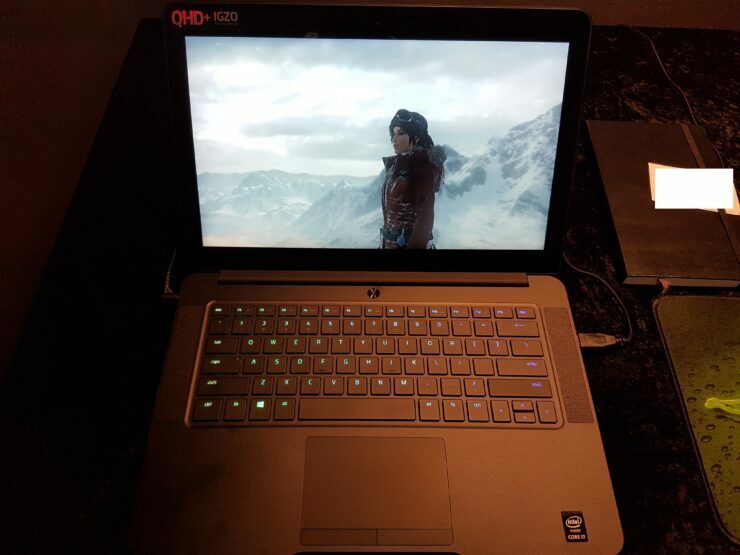 I fire up Rise of the Tomb Raider and navigate to the benchmark while all around me, a Razer CEO, executive and PR guy struggle to figure out how a Nespresso coffee machine works (you think I’m joking, it’s true!). Ignoring their desperate cries for help with a “CRY MOAR!” retort, I press on with the benchmark. The fans spin up and they’re definitely audible as you’d expect but not overwhelmingly so. I’m seriously impressed. Pascal itself is obviously at play here, as is TSMC’s new node bringing thermals down a treat, but we shouldn’t discount Razer’s engineering prowess in cooling this GPU in such a tight space. I’ve not seen a single other 1060 with this kind of chassis size. Razer has done a good job here. 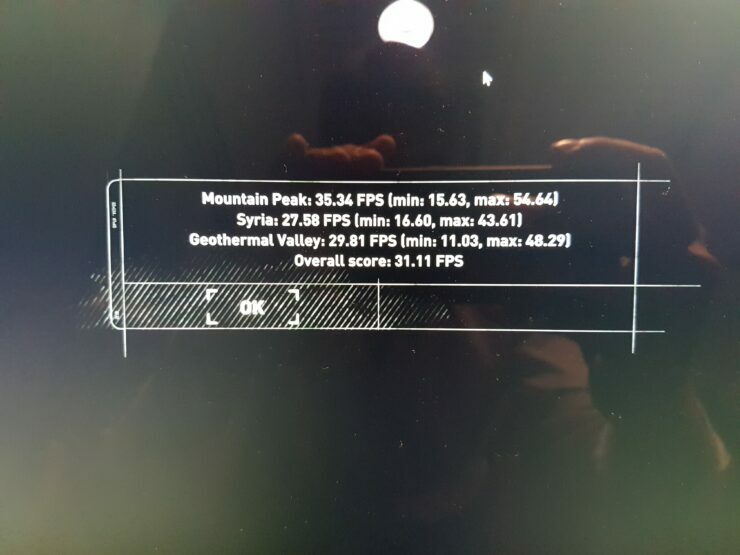 The benchmark finishes and at full resolution (3200×1800) the Razer Blade scores an overall 31.11 frames per second. A great score given the resolution, personally I’d be tempted to lower the res a bit and boost the FPS but there are plenty who would consider that playable. The bench aside, the machine is physically beautiful, snappy, responsive and with a lovely touchpad. Ultimately, I’ll definitely be buying one and that’s pretty much the surest endorsement I can give.